It’s hard to believe it’s been six years since my time as an undergraduate at UConn. It was wonderful to be a part of the then smaller but committed community of students studying in the human rights minor program, which is now offered as a major. My academic research, interdisciplinary coursework, and extracurricular opportunities provided me with the foundation for a lifelong desire to pursue a career in social justice work.My undergraduate experiences have inspired me to continue to learn and grow in my studies and professional life. In January 2013, I completed a graduate program in International Affairs at The New School. A pivotal moment during my studies was my participation last year in the Transregional Center for Democratic Studies’ Democracy and Diversity Institute in Johannesburg. As I prepared to write my thesis, I was moved by the various memory projects I witnessed in South Africa that represented the hope of initiating social change in the post-apartheid state.Throughout history, memorials have been constructed to honor national heroes and to commemorate those who fell victim to tragedy and violence. While I prepared to write my thesis and reflect on my past experiences I was moved to recall my fellowship experience through the HRI working at the International Criminal Tribunal for the former Yugoslavia. The use of public spaces can be powerful in their symbolism for re-imagining nationhood for previously marginalized people and for the importance of human rights, justice, and accountability. Heritage sites can serve to legitimize norms and practices for both individuals and groups who are moving from place to place every day. 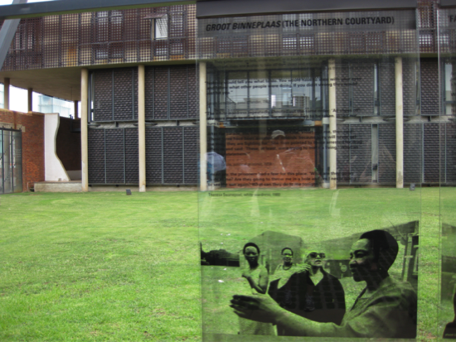 It is encouraging to see several recent memory initiatives become more dynamic and inclusive, and as a result serving to generate increased public engagement.Reflecting on locations such as Constitution Hill revealed the potential for increasingly fluid sites of memory to impact public discourse. This dialogue has served at times to empower and mobilize disenfranchised people to seek social change and support new forms of citizenship to emerge. Thinking about this possibility connected me to my own family story of fleeing persecution, the legacy of memory, and the power of today’s immigration narrative in the United States. I used this reflection and my professional and academic experiences to write my thesis on how violence has been memorialized in post-apartheid South Africa and what the implications are on citizenship. The person I am today is in part a patchwork of these incredible experiences. In my current work at Bend the Arc: A Jewish Partnership for Justice, we are working on a campaign advocating for fair and just immigration reform. Millions of Americans have grown up with a defining family immigration story. Although our families often endured adversity coming to America, most of our immigration stories would be unlikely under present immigration laws. We have created the following tool to find out if our ancestors could come to America under today’s laws. http://www.entrydenied.org/ I know for my family, like many others, we would not be as fortunate today. As we continue to mobilize around immigration reform legislation, I’m grateful to be a part of a movement that’s engaging people and communities throughout the United States, working to create economic opportunity and promoting social justice.